Since the 1980s, French charitable and non-governmental organizations have been building and operating small spirulina algae systems in Africa and Asia using appropriate technology and developing simple and effective growing and processing systems. Upon returning to France, some technicians who became expert in local spirulina cultivation began small scale production at home. After several years experience working at spirulina farms around the world, Philippe Calamand built two microfarm greenhouses at his homestead in the South of France. Since 2001, with 300m2 pond area, his greenhouse ponds have produced about 300 kg over 5 summer months. Each year, local demand for Spiruline La Capitelle (spirulinelacapitelle.com) noodles has exceeded capacity. And so, a new entrepreneurial business model emerged for growing spirulina in microfarms and selling to the local community in the developed world. Earlier, Ripley Fox published his book “Spirulina: Production & Potential” in 1996, which included sections on costs and materials for family scale farms and a technical manual for growing spitulina. In 2002 Jean-Paul Jourdan published his manual “Cultivez Votre Spiruline” (Grow Your Own Spirulina). Gilles Planchon published “La Spiruline Pour Tous” (“Spirulina for Everybody”) in 2009, an easy-to-read manual (in French) for growing spirulina. A spirulina school was established at the CFPPA Center in Hyères in 2005 and Jean-Paul Jourdan became a professor of spirulina culture, engaging more people to join this community and training entrepreneurs to grow their own algae business. As the numbers of microfarmers grew, by 2008 the Fédération des Spiruliniers was organized as an association with 80 members to agree on good business practices and guidelines for quality control. In 2011 work began on a Federation Charter, with quality control standards and good manufacturing practices. One goal is to coordinate food standards with government agencies on regulatory issues as they arise. By 2010, 100 microfarmers were operating from the Mediterranean in the south to Normandy in the north, from the Pyrenees to the Alps. By 2011, the microfarm movement had spread to Spain. Today French microfarmers sell all the spirulina they produce, supplying about 10% of the estimated French market demand. Based on current trends, by 2015, 500 algae microfarmers are projected for France. Laurent Lecesve in Normandy, France. This project Organic Spirulina Microfarm with Biogas Plant was awarded First Place Prize in the International Algae Competition for algae systems. An experimental integrated spirulina microfarm is located in the far north, 3 km from the Normandy Coast. Eco-Domaine Ferme de Bouquetot (ecopya.org and hyes.eu), has four 50m2 algae ponds, one pond is grown with organic nutrients from a biogas digester. Ponds are heated, covered and insulated to retain warmth. 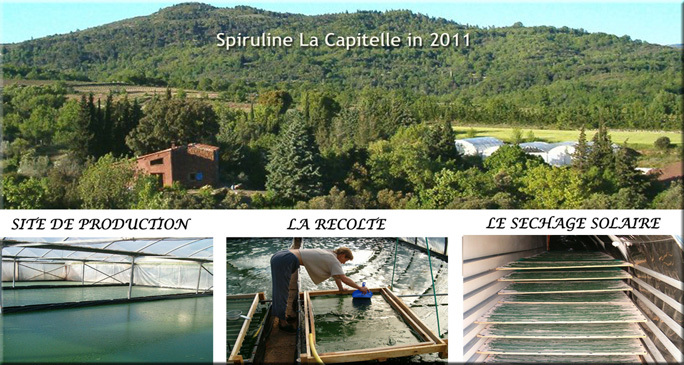 Today Spiruline La Capitelle has the same size greenhouses as in 2002, and sells out the entire production every year on the local market. Price direct to the consumer is Euros 150 for 1 kg dried spirulina. La Capitelle product mix is 80% dry, 20% fresh. Although small-scale production may cost more that large producers who enjoy economies of scale, when microfarmers sell their product direct to the customer they capture the entire retail value chain. Going Direct: Big producers get only 10% of the retail price selling bulk spirulina in quantity to manufacturers. They may capture 35% of the retail price when they tablet, bottle, label, package and market branded finished products and sell through the typical wholesale and retail distribution system that takes at 65% of the value. When microfarmers sell direct to customers in the local community, they can capture 100% of the retail value. Fresh spirulina aquamole: Great way to consume fresh spirulina paste is in recipes for dips and spreads, popular in France. Aquamole is a guacamole dip made by blending fresh algae with yogurt, cream cheese, herbs, and guacamole spices for a savory green dip for crackers, chips and bread. How to Eat Fresh Spirulina Algae. 4 minute video of fresh spirulina Aquamole dips for chips, crackers and breads (2011). First fresh spirulina drink: Spiralps® (spiralps.ch) is a new type of natural soft drink, the first of its kind containing fresh spirulina, organic fruits and alpine herbs, just introduced in Europe in 2012. Fresh spirulina in Spiralps® tastes great, better than dried algae, and is nutritionally superior. It is not cultivated in an open pond, but in a controlled greenhouse environment in Germany by a team of specially trained biologists. Fresh spirulina is treated by low temperature, high-pressure pasteurization system. In response to the question “How can I grow my own algae?”, Jean-Paul Jourdan and others have published manuals on how to grow spirulina, encouraging people to get personally involved in growing algae for family, friends and community. Algae microfarming is a perfect fit for the growing Do-It-Yourself movement and the trend growing food and herbs indoors, in greenhouses, on rooftops and in empty lots in urban, backyard and community gardens.